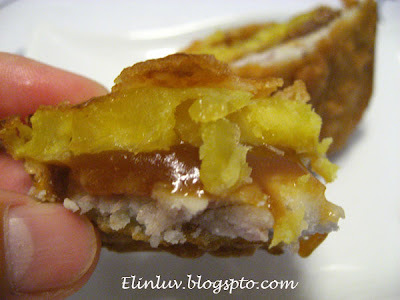 This sticky rice cake / nian gao is a must have item for the Chinese celebrating CNY in Asia . For the businessmen it meant prosperity and for the working people it meant they get their promotion every year ;))) Most Chinese love to eat it either steamed and rolled in freshly grated coconut or fried it sandwiched between taro/yam and sweet potato. It can be kept in the fridge for a year or so , provided you sliced it first ( easier to cut when it is still soft) and stored in air-tight container . Many of us do that so that we get to eat this sticky rice cake through out the year! 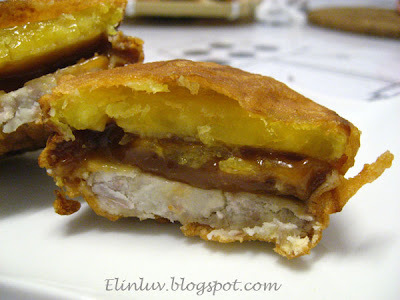 Last Sunday , I fried this nian gao sandwiched between taro and sweet potato as afternoon snack for the Piggies . The oooos and the aaaarrs can be heard when I served these for their tea snack. 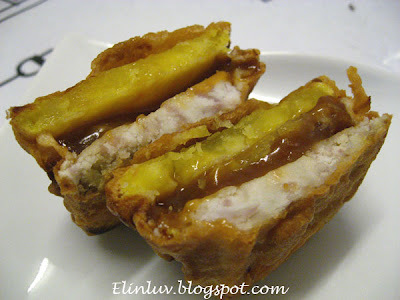 The crispy outer layer and the gooey sweetness of melted nian gao oozing out was sweet heaven itself, truly a bomb in the mouth !!! when I served these bombs for their tea snack. 1. Peel ,cut and wash taro or yam,sweet potato and nian gao,set aside. 2. Preheat oil in wok . 3. Combine egg , rice flour , superfine flour , corn flour, salt , baking powder and water in a medium bowl,whisk all ingredients till you get a smooth batter.If the batter is too thick, add in some water, little by little at one time, do not make the batter too watery, coz it's can't hold the nian gao ,taro and sweet potato together. If the batter still have some lump, sieve with a siever in another bowl. Leave to rest for ½ hr. 4. 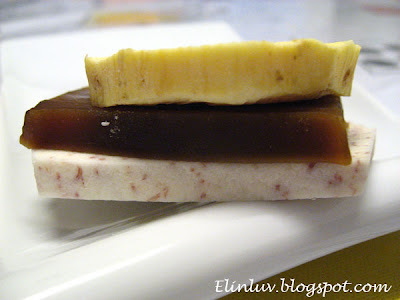 Place 1 slice of sticky rice cake /nian gao between a slice of sweet potato and and a slice of taro/yam. Dip the sandwiched sticky rice /nian gao into the batter and fry over slow medium heat for 2-3 minutes or until golden brown. Drain on paper towel before serve. i stumbled upon your blog recently and since then, have been hooked. must say your kids are very lucky! Haha, we eat-in most of the time, so I am not good at recommendations on good makan places in Ipoh. I would recommend you to this blog and this food blogger post up mostly good eating places in Ipoh. Hope it helps. 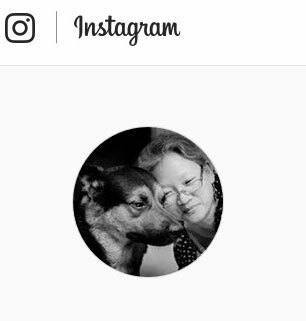 wow, thks a million! will go check out the blog. My goodness that looks wonderful! This makes me think of my mom. 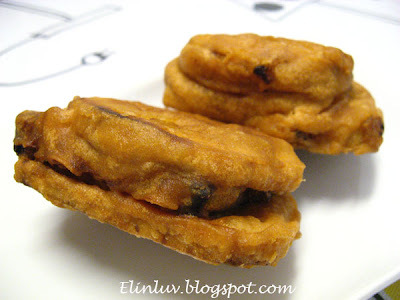 She served up fried slices of yam, taro and nian gao (separately, never as a sandwich) as after school snacks too. I loved them.